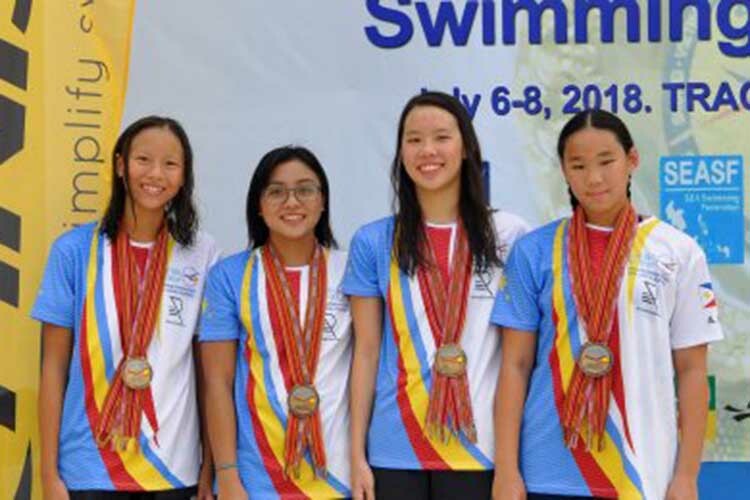 LOS BAÑOS, Laguna — Xiandi Chua delivered the country’s first gold medal in the 42nd edition of the Southeast Asia (SEA) Age Group Swimming Championships that kicked off at the Trace College Aquatic Center here Friday. Chua, a Grade 12 student at the Immaculate Conception Academy, topped the girls’ 200 meters Individual Medley (IM) event in the 16-18 years old category with a personal best time of 2:18.60. Indonesian Azzahra Permatahani finished second (2:20.74) while Vietnamese Lin Mai Thi Linh (2:21.57) placed third. “I’m happy because it’s my first gold in the tournament,” said the 17-year-old athlete, who has been competing in the SEA Age Group Championships since 2014. Last year, she won one silver (200-meter backstroke) and two bronzes (200-meter IM and 400-meter IM). In 2016, she had a silver (200-meter backstroke) and a bronze (400-meter IM) while in 2015, she had one silver (400-meter IM). The 5-foot-6 Chua, who has been training under seasoned coach Pinky Brosas for three years now, was up against the best in the region but she did not give in to pressure. “I was more relaxed. I’m more calm. I did not let the pressure affect me,” she said when asked how she felt before the race. Aside from her gold performance, Chua also pocketed the bronze medal in the girls’ 4×200-meter relay team with Janella Alisa Frances, Zoe Marie Hilario and Athena Shannessa Chang. Last week, Chua won the bronze (400-meter IM) in the Singapore Open. Meanwhile, the Philippines also garnered three silvers and six bronzes in the three-day tournament organized by the Philippine Swimming, Inc., headed by Lailani Velasco and supported by the Philippine Sports Commission, Finis Phils., Boysen Paints, Enoc Lubricants and Wilcon Depot, Arena Philippines, Club 30 Plus Golf, Orocan, Tajima Phils., Twin Oaks Sucere Corp., and Vics Construction Supply. The silver medalists were Jalil Sephraim Taguinod (boys’ 50-meter breaststroke in the 13 and under category), Jerard Dominic Jacinto (boys’ 100-meter backstroke in the 16-18 years old category) and Jonathan Cook (boys’ 200-meter IM in the 16-18 years old category).